Seeds or plays on table. Your cards may seed and play (one per turn). 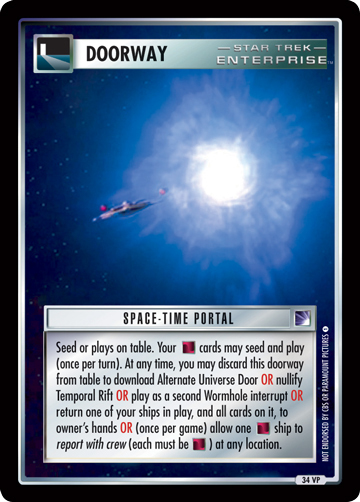 At any time, you may discard this doorway from table to download Alternate Universe Door OR nullify Temporal Rift OR play as a second Wormhole interrupt OR return one of your ships in play, and all cards on it, to owners' hands OR (once per game) allow one ship to report with crew (each must be ) at any location.